Our menu changes on a regular basis and is written and designed by our team of creative chefs, all of whom have a passion for quality, fresh, local produce. The menu is a mix of classic British dishes and also some more interesting modern dishes with a international influence. A very busy Easter Saturday night but we had a lovely evening. The staff were friendly & helpful. The food was excellent & the service very good. We’ve been coming here for years & never had a bad meal. Great evening, great food great service nice  touch with sparkler for birthday girl age 55. Food was lovely . Staff were friendly and very attentive. Will definitely be back soon . Always a high standard in all respects. Have eaten here twice and on each occasion the food and service has been amazing. We will definitely be back. Have enjoyed many meals at the Queens over the years however this time was very disappointing. We have often dined at the Jug and Bottle in Heswall, Wirral (another Stange pub) which is excellent in all aspects. Expecting similar standards from the same group, there was no comparison unfortunately. The staff are lovely & friendly. The atmosphere is quiet yet comfortable. The food is delicious & there is a variety to suit everyone. Great service again by the crew. Food not as good as on previous visits sadly pasta over cooked. Desert sauce more like a gravy ! We all enjoyed our meal very much. We particularly liked the round table which enabled us all to chat and catch up as we live in Anglesey and the Wirral.! the food and presentation generally good, ahead of the competition in Llandudno and beyond in North West Wales. The prices may be on the high side - the desserts particularly so. However in summing up a very pleasant visit. Excellent choice of meals and first class service. 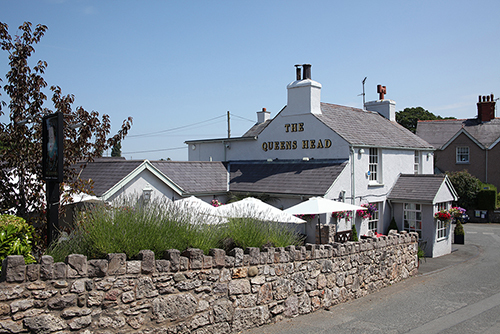 We always enjoy our visits to the Queens Head and look forward to our next meal there. We had an excellent lunch for our friend’s 91st birthday. We all had something differnt and the food was excellent. Plenty of choice and attentive service. We are regulars and will definitely book again and we do recommend the Queens Head to our friends. Really fantastic food and with quick and friendly service.